This indicator scans for Pin bars, Morning/Evening stars, Engulfings, Tweezers, Inside bars and Pennants and Triangles. Can use RSI as a trend filter for pin bar, morning/evening star and engulfing formations in order to properly identify potential reversals. The Pennant and Triangles scanner identifies high-probability breakout patterns. It does this by identifying strong, symmetrical Pennants and Triangles. This pattern DOES NOT appear very often on higher timeframes. But when it does, it is a very high-probability setup. Please see screenshots here: https://www.mql5.com/en/market/product/23290. Please note that due to the multifunctionality neither buy and sell advice nor lines and arrows will be drawn on the chart. I recommend you to put the indicator on EURUSD M5 chart. A clean chart without any other indicators, Expert Advisors etc. on it is preferable. Scan for bullish and/or bearish: This is a drop down menu where you can select if to scan for only bearish or bullish pin bar, engulfing, tweezer and star formations. Trend filter to use: Drop down menu where you can select the desired trend filter. Enable pin bar scanning: 'true' or 'false'. 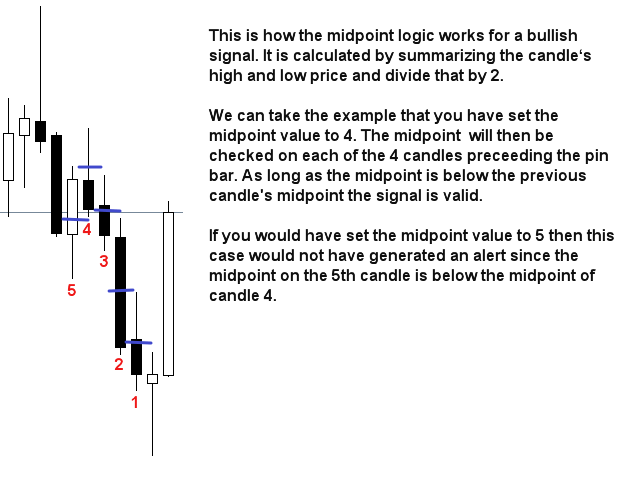 Use candle midpoint logic (0=disabled): See screenshot below. Use trend filter: 'true' or 'false'. Enabled ('true') will give fewer signals but higher quality. Enable tweezer scanning: 'true' or 'false'. Enable engulfing scanning: 'true' or 'false'. Range candle B engulfs range candle A. Body candle B engulfs range candle A. Body candle B engulf body candle A.
Min. candle body size % (0 = any body size): A higher percentage (larger body) will give higher quality signals. Min. candle size in points (0 = any size): Only candles (second candle) larger or equal than this size will give an alert. Default is 0. Max. engulfing candle size in points (0 = any size): Only candles (second candle) smaller or equal than this size will give an alert. Default is 0. Use trend filter: 'true' or 'false'. Enabled ('true') will get fewer signals but higher quality. Enable morning/evening star scanning: 'true' or 'false'. Use trend filter: 'true' or 'false'. Enable inside bars scanning: 'true' or 'false'. Minimum amount of inside bars: Default is 3. Maximum amount of inside bars: Default is 20. Enable pennants and triangles scanning: 'true' or 'false'. RSI overbought and oversold levels: The candle must form above/below these levels in order to give an alert. Symbols to scan: Here you will put all symbols you would like to monitor. 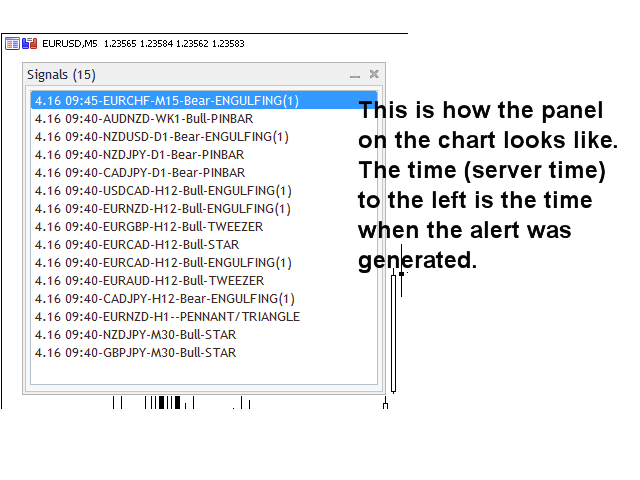 Every symbol must be put in the exact way as it is visible in the Market Watch window and separated with a comma. If you put a symbol not visible in the Market Watch window, that symbol will not be scanned. I especially thank Jan that with professionalism and helpfulness has helped me to solve a problem that was not the indicator but of the MT4, but together we have solved everything even if today is Sunday, I recommend to all its services and its products. Great job on this indicator. Has many functions, extremely useful tool. Excellent communication with the developer. Great Scanner use it every day. Agree with other reviews. This scanner works as the overview states. It is a must when trading manually. Developer is knowledgeable friendly and quick to respond to questions. 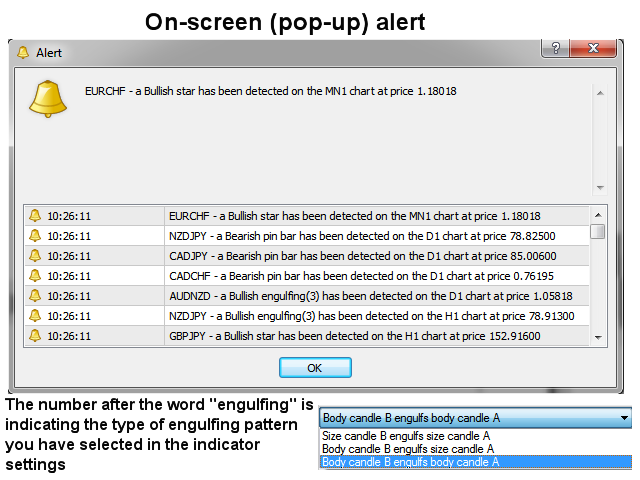 - The alert will now give information about which type of pattern you have selected. Please see screenshot.